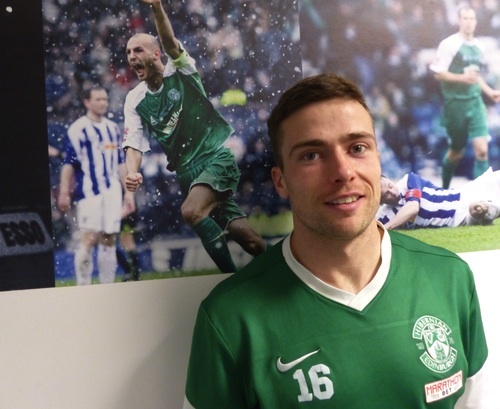 Hibs stalwart Lewis Stevenson is set to be awarded a testimonial by the Easter Road club as he gets ready to celebrate ten years as a first team player. After joining the Leith outfit as a 14-year-old, Stevenson went on to make his competitive debut in the September 2005 League Cup victory at Ayr United. Stevenson recently signed a new two-year contract that will tie him to Hibs until summer 2017 and talks are underway behind the scenes to recognise the 27-year-old’s decade-long loyalty to the club. Stevenson said: “I think it’s (a testimonial) in the pipeline, I’m not sure what is happening yet. I’m hoping further down the line that we can get something sorted. “I took everything with a pinch of salt when I first came in but it’s a good achievement to be at a club so long and hopefully there are many more years to come. The left-back, who was named in last season’s PFA Scotland Championship team of the year, added: “Last season was probably my best one playing-wise, if I need to fill in a role I will but it probably does help when you’re playing in the same position week-in, week-out.